We adopted Flopsy a few months ago and thought we'd give u an update on her. She is a wonderful cat and a great companion. She has adjusted very well here. She has put on weight and plays alot, she really likes the laser lights to chase around. She also likes to have her belly rubbed!! We wanted to thank everyone there for bringing us together. You all do wonderful work there, please keep it up, a lot of kittys depend on that. 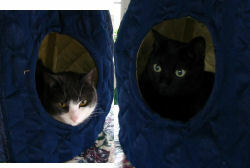 Willy (black, 4 ½ years) and Newman (gray&white, 4 ½ years) LOVE their new teepee bed!. 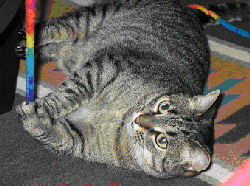 Willy was adopted from Pat Brody January 2002. When I last contacted you, Estelle was establishing herself well in our home. Everything was going very smoothly (almost too well!). I did have one concern, in that Estelle hadn't ventured upstairs yet. Not to worry! She took her sweet time, and eventually made her way onto the bed. She is quite deferential to our senior cat, Seal (big gray aggressive female), but does not back down when (rarely) confronted. I hate to anthropomorphize, but Estelle is the picture of a strong Southern Lady: Lots of petticoats. Gracious, but firm. When confronted she will not back down. "No Ma'am! I am not movin til the levys break. You, Seal Girl, are welcome to take your attitude else-where." What surprised us about Estelle is her personality! While we appreciated her resolve, we had no idea what she was holding back. She is SO funny! And playful! At all hours! We started allowing her outside for limited amounts of time, and soon learned she is an accomplished mouser/moler. But while she is inside, she often races around, yells "Puurrp!" and chases a toy. Her funniest trick is catching the toy mouse (okay, one of the toy mice...we have about 17) and then meowling as if she had caught a real mouse. All of the other cats are now onto this trick, but I have never actually caught her in the act, so that is still part of the fun. Estelle is a prankster! All of my cats (all from shelters) have nicknames which evolve over time. Apollo is "Chicken", his sister Chayla is "Wubbie." Gwen has always been "Peanut" or "Baby Peanut" Seal has about 20 nicknames, including, "Bun amongst buns, Loveliness, Kiss-a-Catum-Catechism, Love of My Life Two..." Ok, you get the point. 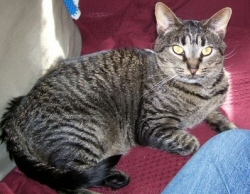 Estelle's nickname began as "Furrball." (I know, not the most loving moniker, but she is very furry, and it is meant in jest!) Now her nickname is "Ball" after Lucille Ball the comedienne. Estelle has an amazing sense of humor! She is so funny! Who knew?! I guess she will be 5 this year. She is very kitten-like in all her play. What is left out of this story is that my husband, Richard was diagnosed with Lung Cancer in February, and passed away this August. He didn't really have insurance. But I do plan to send you something. I really appreciate everything you do. You are the best shelter I have ever visited! Estelle has been a godsend during this awful period of grief. "Ball" is still bonding with me, and (I think) senses what I am going through. Again, thank you for the great work you do! She is doing great! I am absolutely amazed at how well she is fitting in here! 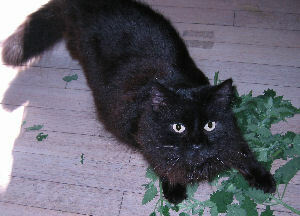 Normally I would keep a new cat secluded for a few days before letting her roam the house and meet our other cats. But it was clear from the first night that she was ready to explore. She's a very quietly confident kitty, and will clearly become the Alpha cat, which is fine - we really haven't had a true "leader" for a while here. The two cats who have been near the top, Seal and Gwen (Gwen is just a year old, Seal is 10) are a little rattled, but there haven't been any fights, only a few snarls and hisses. Easter (we're actually going to rename her Estelle) handles everything with aplomb. We're making sure to give everybody lots of extra love. She's been great about litterbox, is eating well, and discovered the scratching posts right away. She's very affectionate, but not too clingy. I bought a special brush with wire bristles, since her coat is a different texture from our other cats, (and I thought she should have her own brush, with her own smells on it) and she lets me brush her - including her tummy. She clearly trusts me and feels completely at ease. Our house has been in absolute chaos for the past 2 days - we had our electrical service replaced, which blew out our computer, and there was some yelling and stress. And we have had a dozen people in and out, and a child visiting yesterday for several hours. Had I ever known it would be this crazy, I would never have considered adopting at this time - I would have waited for a quieter time. But Estelle is nonplussed by it all! She's friendly with everyone, especially the little boy who was here, doesn't startle easily, or get frightened by loud noises! I couldn't have picked a better kitty for our home! After a couple of weeks, we will see if she is interested in venturing outside to hunt with Goblin. Right now, we feel it is important for her to remain inside and get settled in her new home. She's obviously been someone's very well-cared for and much loved pet. And she continues to be so here! Thank you so much for letting us adopt her! You have a wonderful shelter. And the set up is perfect - the cats seem so much less stressed being able to roam about, and it gives people the opportunity to really get a sense of their personalities! I know I made the perfect choice and that we're all going to be very happy for what I hope will be many many years to come! We picked up two cats last Saturday and have been so delighted with them. Priscilla (I think) asked me to send pictures so here some are. They look best in slide show format. 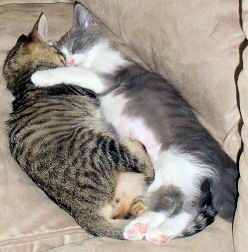 Both cats, Davis #1 (black, now Panther) and Iris #2 (gray/white, now Princess) are adjusting well. Thank you again for a wonderful cat adoption experience. I just wanted to let you all know that Petunia #1 and #3 (now named Link (orange) and Roxy (calico)) are doing fabulous in their new home! I have attached a few pictures. They are so cute playing together and are getting plenty of love from their new owners! The first day has gone well. The kittens mewed a fair amount on the way home, especially the boy cat. But they immediately calmed down once at home. They were a little shy at first. I kept the kids real quiet. Within an hour or so, they were playing away. By about two hours, they were cautiously asleep. After about an hour of dozing, they started romping around. We fed them fancy feast (they always have water and dry food) and they found the litter box. 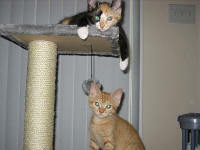 That night, my 7 year old wanted to be in a room away from the kittens as they were doing "road races" around the room. So, my older son and I had the kittens. The first night they were real friendly, purring all the time, so we didn't get much sleep. But last night they settled down at the foot of the bed (although sometimes under the covers) and pretty much slept through the night. Sunday, they acted like they owned the place. As you can see in the photos, they do like one another. It's great to have kittens in the house! This morning, they romped from about 6am-8:30, then meowed for food. 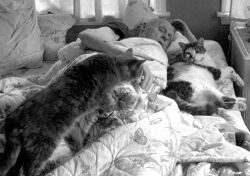 They gobbled down the fancy feast and went back to sleep. Weird that they crawled back into the cat carrier, as they had not done that beforehand. Well Duncan did not take long making our house his home! As you can see he looks pretty comfortable in the place & he is quite charming to boot. He hasn't eaten a lot yet but we are chalking that up to the new surroundings. Cosmo, on the other hand, did not emerge from behind the bed until Sunday evening but now he only hides when he's afraid. He also likes to sit in the window & watch the world go by & is quite a jumper! Cosmo is eating just fine, we think maybe he going through a growth spurt!? 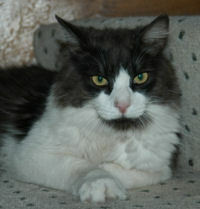 Anyway, I will take a few photos of Cosmo & send them along in a few days. Thank you for helping us bring these two cool dudes into our lives! I just wanted to give you an update on Jillian.. renamed Jasmine. She is doing great! She and our male cat Kilo get along wonderfully! She is putting on some weight and isn't so skinny any more. She is such a playful cat and loves to attack our feet and toes. She has brought my male cat out of his depression and sulking around. We love her so much and are happy that we got the chance to better her life. Thank you for introducing us to Jasmine. She really has made our home happier. As you can see Patches is doing very well. Pearl is allowing her in her bed with her Master. She is a neat cat and we just love her. 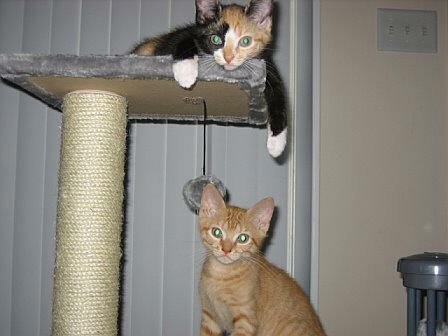 I am happy to report that Muffin and Mardi Gras are adjusting well to their new home. When we got home from the shelter last night, we let the cats out of their carriers and into the room we will use as a dining room, because it is large, has a glass door to the hall and a large glass French door with side lites to the foyer and a 9' sliding glass door to the yard. We won't let them out, but they can see a lot from that room. They immediately began investigating every aspect of the room, including the couch and other items that are temporarily stored in the room while the house is renovated. Neither one hid. On the contrary, they wanted to get out of the room an investigate further, but we felt they should acclimate in one room, at least over night. This morning, we let them out to sniff around the first floor of the house. They seemed to enjoy doing so. After a while, before my renovation contractor arrived, we put the cats back in the dining room, to keep them out of harm's way. This evening and possibly overnight, we'll let them roam around some more. I hope you remember me! I used to be known as June, back before I was adopted. I wanted to let you know how well things are going at my new home. First of all, I have a new name, which is Mala. Just so you know, it has nothing to do with the Spanish word for being bad. My mom speaks little to no Spanish. Actually it is short for Animala, which is from a funny movie called The Lost Skeleton of Cadavra. What can I say, except that my new mommy loves movies. Life is great here in Arlington. I have a carpeted tower where I sleep in the sun most of day. I have plenty of food that I don’t have to share at all. And I get to play with people all the time. Catching colorful fleece things on a stick. I’m very good at this! I must say that I absolutely love my new life! I have become part of something called Red Sox Nation. I’m not sure about this yet. I think it may be an Indian tribe. My mom tried to get a little blue headdress with a ‘B’ on me for another picture, but I finally put my paw down. Enough already with the camera! Anyway, I do miss all my friends at the shelter. I hope many more friends get the chance to be adopted like I was. Life is good! Miss Melanie, or Miss Melanie Belanie Boo, as we often call her, has been a wonderful addition to our family since we adopted her on July 8, 2006. Boo Boo, our other female cat, still isn't so much a fan of hers, and hisses at her occasionally, but Dr. Zoidberg, whom we adopted from you back in December 2004, seems more accepting (Melanie likes to chase him around the house). 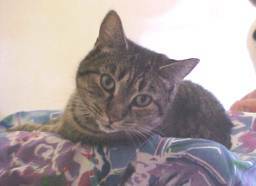 At first, we kept Melanie separated from the other cats for about two weeks in a small area upstairs. Her initial adjustment period was a bit rough. She didn't eat, drink, or use the little box for the first 24 hours or so. Given that she'd been at the shelter for nearly two years, however, we knew she was going through a big change. She would always hide when we came into her area, but after a little coaxing, sweet talk, and petting, we could always get her purring in short order. When Melanie first had her run of the house, she stayed upstairs most of the time, but she's been spending more and more time downstairs as she gets more comfortable. The three cats have all been eating their breakfasts and dinners together for about a week now, and all three hang out with us downstairs at night. Every morning when we wake up, she hops up on the bed for her morning petting and loving session. Every night when we get home, and then again before we go to sleep, she does the same. And it's a joy to watch her discover all the kitty toys we have around the house - it's like watching a kitten play! She's also an extremely talented mouser. The first two nights she had the run of the downstairs, she caught a mouse each night. Now we're mouse-free. Hopefully if any more ever venture in, Melanie will teach our other cats some skills, seeing as how they clearly have none! Although she's clearly pretty aggressive when it comes to mice, Melanie is the gentlest of kitties when it comes to humans. She's never made the slightest attempt to bite or scratch, and gives us nothing but love (well, and a couple of dead mice). You were absolutely right about her little "circle dance" - when you pet her, she scoots herself around in a circle, gets up, turns around, flops down, scoots again. She gets lots of belly rubs that way. And after a few minutes of purring, she upgrades to her super-purr, which sounds like she's half ribbetty frog, half chirping bird. She doesn't even sound like a cat! We get a kick out of it every time we hear it. Thank you so much for her! You guys do such a great job. When we came to the shelter, we were really hoping to be able to adopt one of the cats that had been there for a long time, and we couldn't be happier that we did!